"The First Easter Bunny" screened Saturday, September 27, 2003 at the Lake Arrowhead Film Festival in Lake Arrowhead CA. The screening went well with everyone in attendance laughing heartily and appropriately. The laughter wasn't as hard and constant as I've usually seen it when screening it back in Massachusetts. But I do believe we were the funniest short -- and I'm not just saying that because there weren't any other comedic shorts, there were a few. The local newspaper - The Mountain News - ran a nice color photo of Mr. & Mrs. E. Bunny that got a lot of buzz building before our screening. The same photo was also used in the official program. Everyone told me how much they enjoyed it and how funny it was as we mingled about after the screening. One girl tracked me down to tell me it was easily her favorite of the festival. Another woman asked for a card because she works on an independent film festival in LA and she wants to show the Bunny. She was surprised to hear how many festivals hadn't accepted us. 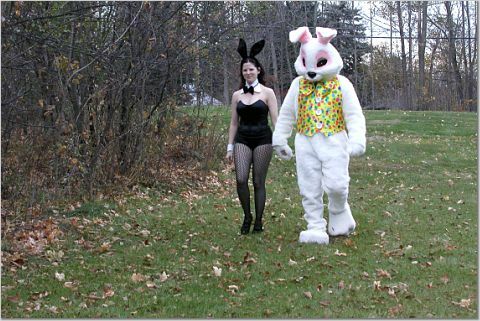 She said she goes to many film festivals and thought The First Easter Bunny was better than many things she had seen screened. We were definitely the lowest budget of the festival and there were a couple shorts that I felt had lower production values than the Bunny. The quality of the other shorts and features was pretty amazing. Almost all the shorts were thesis films for people graduating from UCLA and USC film schools and they all looked very slick and had quite extensive crews. Many of the features were many years in the making. There was one comedy, "Bachelor Man", that was just hilarious and could easily have been a "real" studio release. It was very broad and raucous - much like any Farrelly Brothers movie. A few celebrities attended various parts of the three day festival - June Lockhart, Eric LaSalle (ER), Vincent Spano, and the "snowball" girl from Clerks. I didn't notice any of them catching Bunny - so it was there loss. During the Q&A I was asked how did I pick this subject matter. So I had to explain that Fitchburg was a real city and they truly did post signs claiming to be the Home of The First Easter Bunny. One reason why I think we don't get into many festivals is that nobody outside of the immediate Fitchburg area realizes there is a factual basis for the film. So we seem even more bizarre and absurd. After seeing so many slick, well-made films and learning of all the resources and education all the filmmakers had - it is pretty amazing we got screened anywhere. Many attendees still talked fondly of "We've Got Johnny" from seeing it last year. All the other filmmakers and attendees were very cool and friendly. And the only bad film we ended up seeing all weekend was the "real" movie Cold Creek Manor - which we found very disappointing.